Oh boy, I am so excited. Award season is upon us and we will be posting the Slappy™ awards later today. For now, I have to hold my nerve by looking back at what happened 12 months ago. While I am on the topic of the Slappy™ awards, the 1st annual Slappy Awards happened this time last year and it is well worth a look before we get to this years awards. The end of January always leads to the beginning of February and Ian C. was getting set for Facial Hair February, a continuation of the previous beard growing months. He was also busy telling us all about how bad the movie Avatar was. Brad was giving his usual commentary on the state of the new CD releases for the week, all with a facial hair theme. The story of the week from way back was yet another one of Jack's masterpieces. 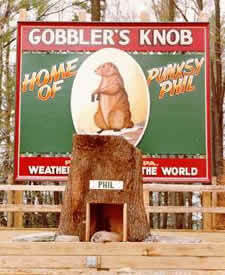 The severe weather which ravaged most of the US 12 months ago caused havoc at Gobbler's Knob, the home of Punxsatawney Phil, on February 2nd which is also known as Groundhog Day. Click here to read Jack's version of the events of that day.